The 15-story black smoker chimney resembles a monster on the seafloor, with hot fluids billowing from holes near its 40-foot wide, mushroom-shaped top. For the awestruck oceanographers who discovered the deep-sea structure in 1991 off the Washington coast, there seemed only one appropriate name: Godzilla. Hydrothermal vent fields and their individual chimneys may be places for serious scientific research, but some of their names come straight from science fiction. Take Sasquatch and Mothra, two of five vent fields located here at the Endeavour Segment. These undersea features, like Godzilla, were named for monsters. Throughout history, when explorers and pioneers on land have discovered a new mountain, valley, or river, they have named it. The sea is no different. The scientists who name hydrothermal vents, chimneys, seamounts, volcanoes, and other undersea features say their inspiration comes from a variety of sources. 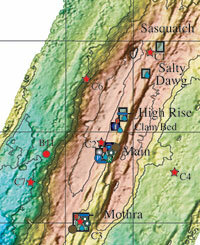 Many deep-sea features are named for their distinct shapes (Organ Pipe and Broken Spur) and formidable sizes (Boomer, Mammoth, Hulk, and Cathedral). 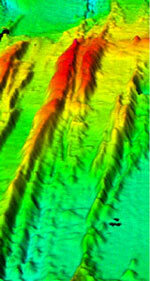 Other features are named for research vessels (two seamounts named for research ships, Knorr and Kairei). Still others honor pioneering scientists: the Edmond hydrothermal vent field in the Indian Ocean was named in 2001 for the late oceanographer John Edmond. Scientists missing their families sometimes name things they find in the oceans for them. Dan Fornari, a geologist at the Woods Hole Oceanographic Institution, named a seamount in the eastern Pacific for his son Sasha, and hydrothermal vents for his wife, CL, and son, Simon. Sometimes, scientists are simply needing entertainment. In the southeast Pacific, west of Easter Island, sits a cluster of vents named for cartoon characters. Scooby, Tweety, Road Runner, and yes—Homer Simpson—can be found on maps in scientific journals. Naming rights usually go to scientists on a research expedition who play a major role in locating the find, said Marvin Lilley, a chemist at the University of Washington who has named a half dozen seafloor features. But not all names are recognized outside the world of independent oceanographic research. Like mountains, valleys, and other features on land, names must comply with policies and procedures to be formally documented by government agencies, said Trent Palmer, who helps manage an international name database of sea and land-based features at the National Geospatial-Intelligence Agency, an arm of the U.S. Department of Defense. The name Juan de Fuca Ridge, for example, was borrowed from the nearby Juan de Fuca Strait, named after the 16th century Greek explorer who was employed by the Spanish to find a northern passage from the Pacific to the Atlantic Ocean. The name was approved at the federal level in 1969. So while a name may not have government recognition, researchers say that when a newly appointed name, however unique, appears in a journal publication, it is accepted within the scientific community. At the Endeavour Segment–home to a dynamic community of worms, crabs, smoking chimneys, and other unusual features–the five vent fields were given some of the more curious names in the undersea world. At the High Rise field, the hydrothermal chimneys are so large and close together that they remind some scientists of skyscrapers emerging from the sea floor. “Flying around there in the submersible Alvin is reminiscent of driving a car downtown in U.S. cities,” said Veronique Robigou, a scientist at the University of Washington who has conducted research at the Endeavour Segment. The Main Endeavour field got its name because it has long been a “main” focus of scientific research at the Endeavour Segment. It hosts more than 100 black smoker chimneys positioned on other, even larger sulfide chimneys towering over 100 feet in height. The Mothra vent field was named for the giant insect monster (from the 1960s Japanese science-fiction movie) that battled the fire-breathing Godzilla. In the movies, Godzilla beat Mothra. But in the sea, Mothra has emerged victorious. Godzilla, the 15-story high chimney identified by researchers in the High Rise vent field, turned out to be top-heavy, and two-thirds of it fell sometime after the 1991 discovery. But beware, Mothra: the toppled Godzilla is rapidly rebuilding (at a rate up to 30 feet in 18 months) as minerals precipitate from hot fluids as they meet near-freezing ocean water and solidify into new chimneys. Godzilla, like hundreds of similar chimneys in this area, is on the rise. 3-D image of the Endeavour segment. It shows that it is basically a very long, linear volcano that has been split in half by spreading. The plate boundary between the Juan de Fuca Plate and the Pacific Plate is defined by the axial valley between the two ridge highs. Location of the five vent fields in the Endeavour Segment. Detail of a hydrothermal chimney in the Mothra Field.